Another truffle recipe! While we used most of the truffle on the pasta, there was still a teeny bit left! I had a truffle aioli a long time ago and it was BOMB. 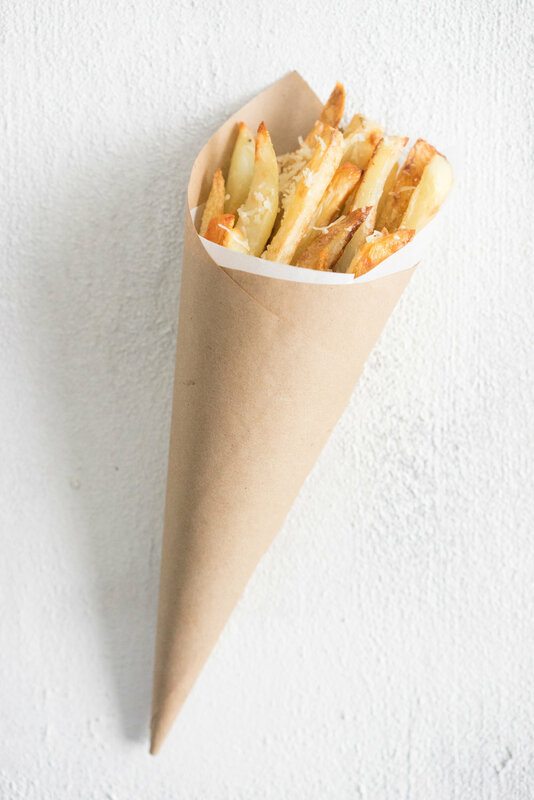 Truffle fries are fairly common - they tend to be parmesan and truffle oil They are pretty awesome too. But there's something about fresh truffle in aioli that really makes me get excited. This is no different really. 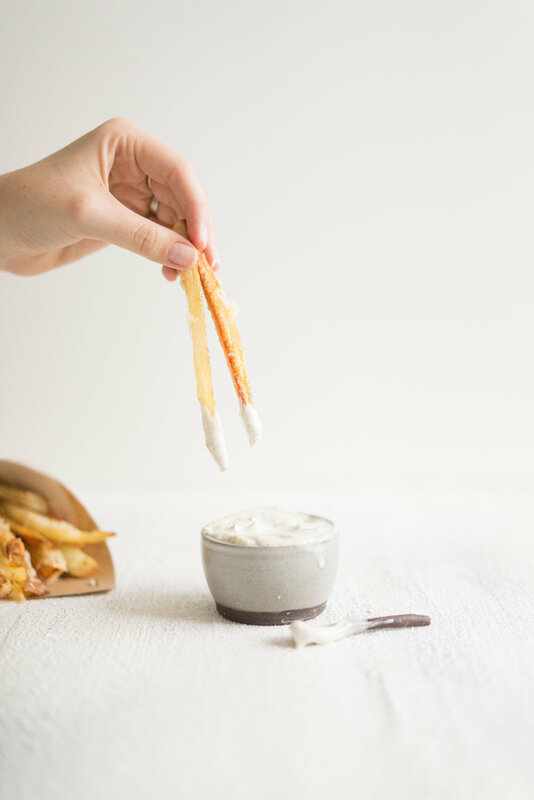 We have been eating this aioli for a few years now, so I figured it was only polite to share it with you, as it really deserves to be out in the open! I have yet to find a nice Jar aioli here in america, and find that making my own tends to be way quicker and easier, not to mention way more tasty! I use a stick blender to make aioli, and to be honest I don't even bother with slowly adding the oil in order to help it emulsify - I just dump all the ingredients in, hit it with the stick blender, then taste and adjust if necessary. I find the stick blender the best way to make aioli - I only like to make a little bit at a time, meaning the food processor is too big, and my blender tends to get too excited and heats it up too much as it is blending, which causes it to split. I have totally also made it by hand before, which takes a lot of whisking, but in a pinch, is still totally worth it. If you make it by hand, add the oil a tablespoon at a time, whisking hard, until it starts to emulsify, then slowly trickle the oil in. I added fresh truffle to this aioli, but it would be just as nice with truffle oil - sub out a tablespoon of the regular oil for truffle oil. It is also amazing without the truffle, which is how we usually eat it - if you are leaving out the truffle, add in a teaspoon of wholegrain mustard. It's just the best, in all of it's forms. You can add herbs to it, use roasted garlic, the list goes on. And then there are fries. 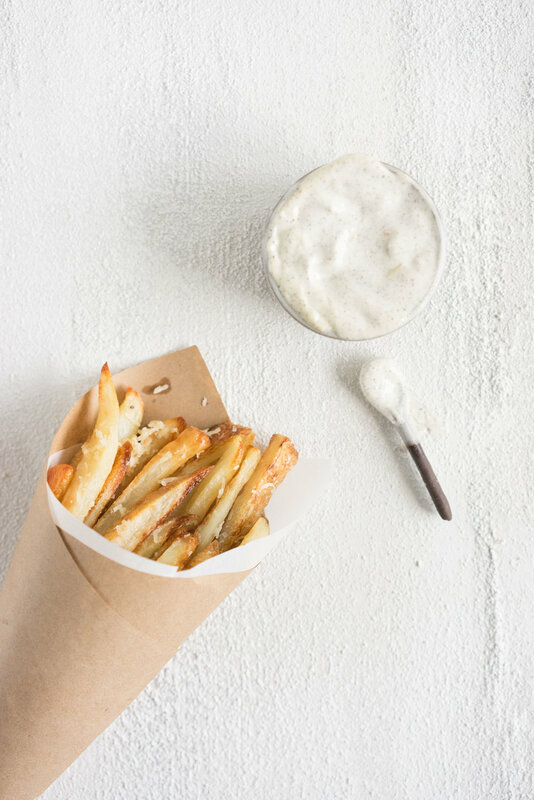 I never thought I could make super crispy delicious oven fries until I came across this recipe on Smitten Kitchen. And now we are hooked. They are perfect as a side for burgers, or just as their own with gravy. I usually use Russet or Idaho potatoes, and generally use one per person, which makes it super easy to scale. 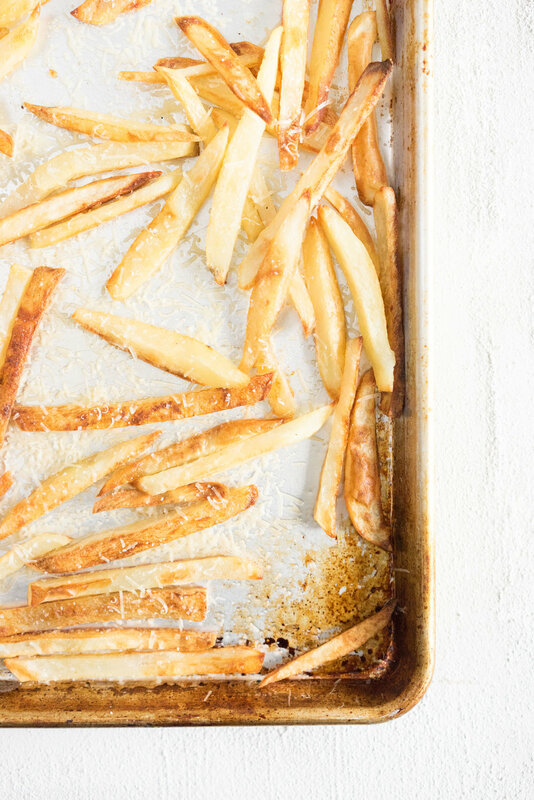 The trick to the perfect fries is cooking them twice - you boil them until they are just beginning to cook, then pop them in the oven on high heat to finish off and make them amazing and crispy. I loaded these ones up with parmesan, which complimented the truffle aioli perfectly. Whatever form you choose to make the aioli, you should make this. It's the best. Note: If you are not making the truffle version of the aioli, add in a teaspoon of wholegrain mustard, and increase the lemon to the juice of one lemon. Preheat the oven to 450˚f / 230˚c. Peel potatoes, and cut into one inch wide fries. Place into a large pot, and fill with enough water to cover the potatoes by about an inch. Turn the element to high, and cover the pot with a lid. Cook the fries for 10 minutes, removing from the heat once the 10 minutes is up (They may not necessarily come to a boil). During the last few minutes of cooking time, add 3 Tbsp oil to a baking sheet, and place in the oven to heat the oil. Once the potatoes have reached their 10 minutes, strain through a colander. Place onto the preheated baking tray, and toss lightly to coat in oil, adding more if necessary. Sprinkle with a small amount of sea salt. Bake the fries for 30-35 minutes, checking and tossing every 5 minutes after the 20 minute mark to ensure that they are evenly golden. Remove from the oven, season well with salt, and sprinkle with parmesan cheese. Stick blender method: Place all ingredients in a stick blender friendly container. Blend on high, moving the end of the blender up and down the container to help combine ingredients, until thick and emulsified. Taste and adjust salt / lemon levels if necessary. Blender method: Place egg, salt, lemon juice and truffle in a high powered blender, and pulse to combine. Turn the power onto medium, and slowly drizzle the oil into the blender in a very fine stream, until the aioli begins to emulsify. Add the remainder of the oil slowly. Taste and adjust seasoning if necessary.